I don’t know about you but cooking did NOT come naturally for me. Over the last 10 years I’ve stumbled my way through the kitchen and acquired some favourite kitchen gadgets that helped me enjoy a healthy lifestyle. I learned how to make a few simple dishes. I was happily going around using my 7 best kitchen gadgets. Then once having a family my world got turned upside down and everything I once knew had to be done with less time and more often. Okay back to ground zero on the cooking front. But first, Can anyone else relate to my kitchen woes? So when I say I’ve developed a love for food and how I can prepare a healthy and tasty meal for my family and friends then you must know I’ve figured my way through it all (and honestly continue to figure out some curve balls along the way). This is when I discovered the best kitchen gadget – number 1 on my list and a FREE gift just for you to go along with it. To be successful in the kitchen and ultimately with your fitness goals I want you to know what I know. There’s 8 best kitchen gadgets, tools and all out life savers that I have been using for the last few years plus each one comes with amazing health benefits. 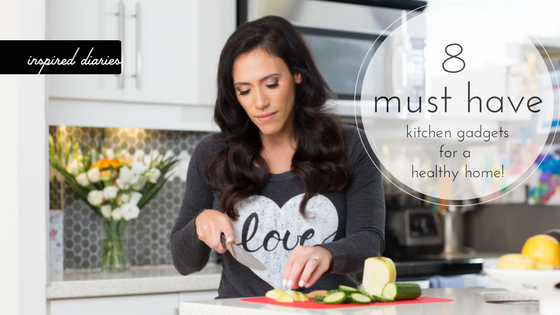 Here’s my top must have, favorite and best kitchen gadgets for YOUR healthy home + a FREE Gift! I know, I know we’re in the thick of the holidays, but this will get you on the flip side of the holidays with yummy meals, little prep time and lots of leftovers for lunches to get you back on track. This magical little juicer saves your lemon juice and allows you to add it to recipes. My health secret is mixing with warm water and drinking first thing on the morning. Lemon water helps to alkaline the body, flush out toxins and get digestion moving first thing. I’m all about efficiency. Basically if an appliance will guarantee a perfect cook each time I will have one. Slow digesting carbs are an important part of balanced eating. Rice more specifically brown rice, whole grain rice’s help slow digestion so you’re full longer. Eventually you’ll be less inclined to reach for that 3pm donut. With many projects through out the year ultimately there comes a time for accountability. I like to understand and be aware of my actual macro intake and this comes from knowing portion sizes. This is not a permanent behaviour but certainly an amazing tool to understand how much food is actually needed vs. wanted. I don’t know about you but waffles get me going in the morning. It feels like a decadent weekend meal. But guess what it’s actually very simple. Mix – dry rolled oats, berries, cinnamon, egg white and an egg into your blender (ahem see below) and pour mixture into the waffle maker. Easy peasy and whole foods for the win! This fun contraption my four-year old can do and participate in the kitchen. Did you know how much confidence is built in the kitchen for kids? So I’ll be honest. I’m not a crazy coffee obsessed person. I enjoy a cup every so often but when we brought this little bundle of joy home I changed my tune. I really enjoy a nice latte or even just use the milk frother for a London fog. Our at home secret is to use the milk frother to add MCT oil for our very own bulletproof coffee. Recently life’s been hectic and I pulled out my slow cooker as a measure of desperation to continue to eat well with little investment into the cooking process. Um…boy was this it. It’s versatile and crazy easy to use. It’s by far my favourite of all kitchen gadgets. As the newly appointment Slow Cooker Queen I want you to join the club and be a Slow Cooker Queen too. Basically this is your new personal chef! Hope you enjoy my best kitchen gadgets (and the recipes).